As ever, the guys at Seaweed and Gravel have produced something of marvel when it comes to Brat / Café Racer style combos. The goal for this Honda CB550 Motorcycle build was to build a bike that was simple, clean and minimalistic with an aggressive, low stance. And boy have they achieved that! Taking inspiration from a weekend build by one of Seaweed and Gravel’s new bike builders Brady, the motorcycle was commissioned by a customer along with some additions of their own. 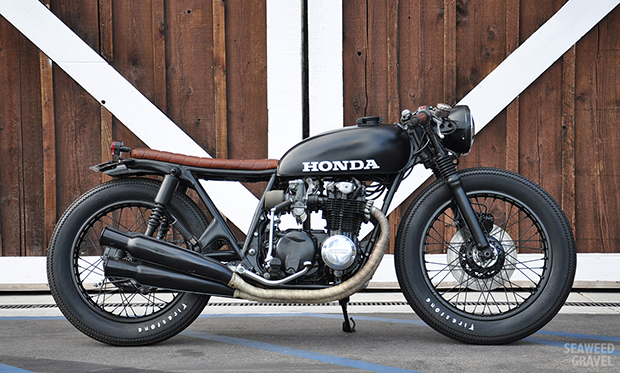 All black customs are somewhat of a challenge to get right, but not with this motorcycle. The use of matt, satin and gloss black across the frame, tank, components and parts, give it dimension and standout features that all come together perfectly. The brown leather seat and grips give it a true authentic look, subtly breaking up the black. As with most brat builds the airbox has gone, replaced with some mean looking after market air filters and the battery replaced with a more compact option from Antigravity Batteries then hidden, opening up the rear frame section. Providing the Honda CB550 with a new set of boots, the Firestone Deluxe Champion tires set the retro tone of the bike but the engine remains largely stock, only rebuilt with new internals and tuned to by a retired racer, to give it some poke and kick! The most important part of this build is that none of the new features take away from the original stock form of the Honda CB550. This beauty looks every inch the meanest and leanest 1970’s motorcycle in town. Do you Build or Buy?